ICC has released business recommendations to facilitate border processes and the customs clearance of essential humanitarian relief shipments. The recommendations were introduced this week as part of the Humanitarian Networks and Partnership Week 2019 (HNPW), hosted by the United Nations Office for the Coordination of Humanitarian Affairs (UN OCHA) and the Swiss Agency for Development and Cooperation (SDC). 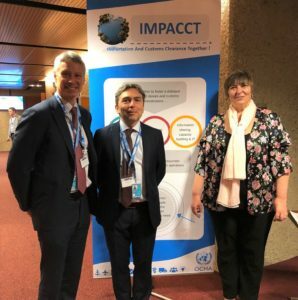 ICC welcomed the opportunity to engage with OCHA and other strategic partners, such as the World Customs Organization (WCO), to create synergies, exchange experiences and expedite collaboration on common operational challenges in facilitating relief shipments. Often when natural disasters strike, the private sector steps in to provide much-needed financial assistance, as well as in-kind goods and services for the effective clearance of relief shipments. Natural disasters disrupt critical business processes, severely impacting the ability of customs administrations and border agencies to process the influx of relief shipments. The lack of contingency and trade resumption planning ultimately results in untimely delivery of relief supplies, or in some cases, shipments that are not granted clearance into the country. UN OCHA Emergency Relief Project Manager Virginie Bohl stressed that “the need for clear and efficient procedures and protocols is increasingly pressing” with the ever-evolving dynamics of humanitarian situations and emergency relief delivery. In order to best capture business realities and efficiently facilitate the shipment of relief supplies, the private sector must be engaged in multi-stakeholder dialogue with the objective of setting out clear protocols and contingency planning for humanitarian relief and trade resumption. Customs clearance is affected by a number of challenges, including limited lists of approved relief supplies, insufficient time for entry of relief shipments and the general lack of a standardised marking system. At the January 2019 World Economic Forum (WEF) Annual meeting in Davos, Switzerland, a group of multinational CEOs agreed to formally establish the Global Humanitarian Action Executive Alliance (GHAEA) on the margins of the September 2019 UN General Assembly. The CEOs engaged with various intergovernmental stakeholders, including representatives from UN OCHA, to explore opportunities for effective and collaborative private sector engagement in humanitarian relief efforts. Crispin Conroy, ICC Geneva Representative Director, said: “ICC is at HNPW 2019 contributing to the discussions between the private sector and other stakeholders on building partnerships to address challenges in the delivery of humanitarian relief. This includes efforts to update and improve the global policy framework for relief shipments in humanitarian emergencies”. In this context, the ICC Business Recommendations on the Customs Treatment of Relief Shipments in Humanitarian Emergencies highlight some of the key challenges business and governments must overcome, and outlines policy recommendations to ensure the smooth and efficient delivery of relief shipments following natural disasters and humanitarian emergencies. The establishment of contingency and trade resumption plans, developed in partnership with all stakeholders, including Customs, border agencies, donor organisations and the private sector. The establishment of an internationally-recognised and accredited system of marking and identification for humanitarian relief shipments for quick and efficient detection. The adoption of the UN OCHA Model Act for the Facilitation and Regulation of International Disaster Relief and Initial Recovery Assistance (in particular Chapter VI Part 29-36). Swift and robust implementation of the World Trade Organization Trade Facilitation Agreement. Learn more about the work of the ICC Commission on Customs and Trade Facilitation and find further information on the ICC Business Recommendations on the Customs Treatment of Relief Shipments in Humanitarian Emergencies.